Animal rights activists protesting outside Liam Neeson's home say they don't agree with him that New York's carriage horses should keep working. Neeson didn't appear Saturday as about 50 demonstrators filled the sidewalk in front of his Manhattan apartment building. They held signs with such slogans as: "Liam Neeson: Stop Supporting Cruelty!" 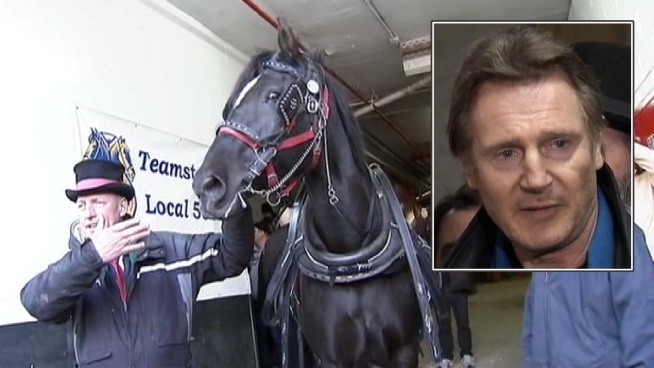 The 61-year-old actor is a vocal supporter of the city's carriage horse industry. His publicist hasn't immediately responded to a request for comment. They say it's inhumane for the horses to be subjected to traffic, pollution and possible accidents.